An unusual thought, unless you happen to be Ross…or his mom, Debi Gerbasi…or artist Jessica Plummer. 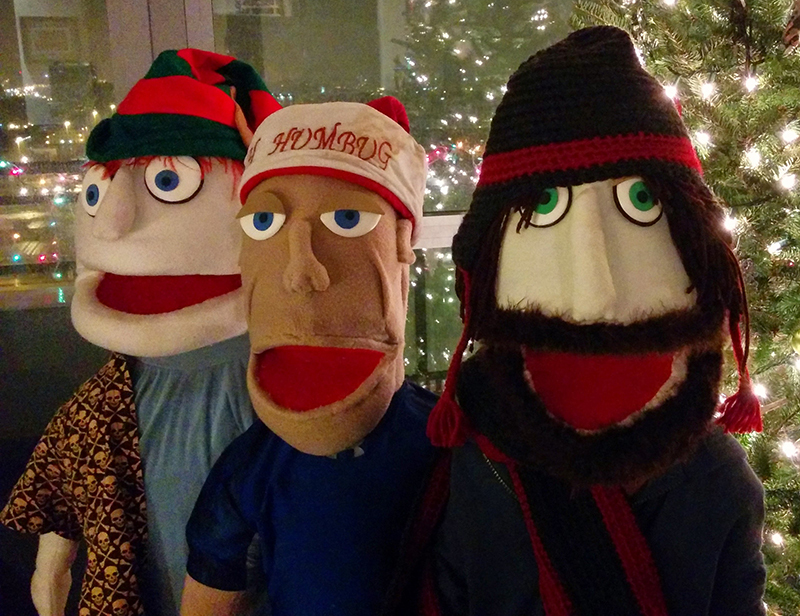 These three started making puppets together for fun about a year ago. Naturally, the group began with puppets of themselves…then of all the guys at Threaded Films (a video/production company with a penchant for film gear). Titan Taylor was almost as big a star as #CBGAlice. Ross Gerbasi and TItan Taylor talked and posed with fans in the bonsai courtyard until 8 p.m.
Jessica took the creative lead for shaping the titan puppet, which is made of foam. Paper templates came first; next came foam that could be heated, bent, sanded, carved, airbrushed, and painted. The spadix (the tall structure in the center) is made of lightweight, open-cell foam…with buttons for eyes. The puppeteer’s arm goes up a sewn-on sleeve inside. 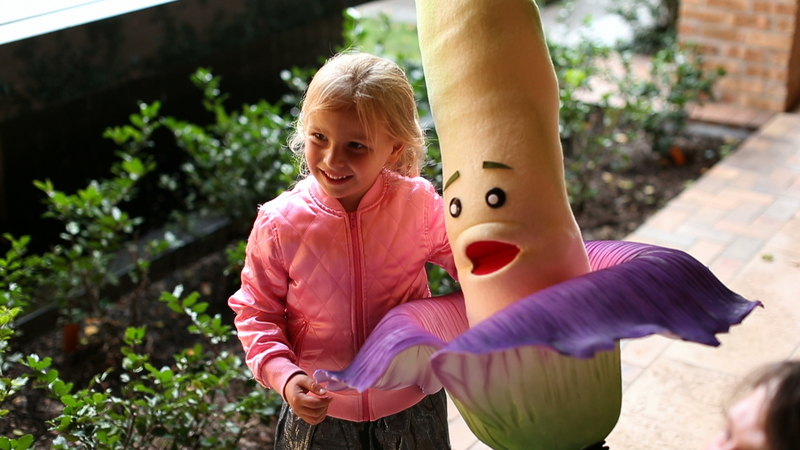 Just as the puppet, dubbed Taylor (whose name was chosen for its genderless quality), was finished, Ross and company heard that a second titan arum had sent up a flower bud at the Garden. Ross brought Taylor to our office to meet us—and we immediately “booked” it as “public puppet” for the night that the second titan, dubbed Alice the Amorphophallus, would bloom. That turned out to be September 29, 2015, and with Ross as puppeteer, Taylor turned out to be an attraction second only to Alice herself. 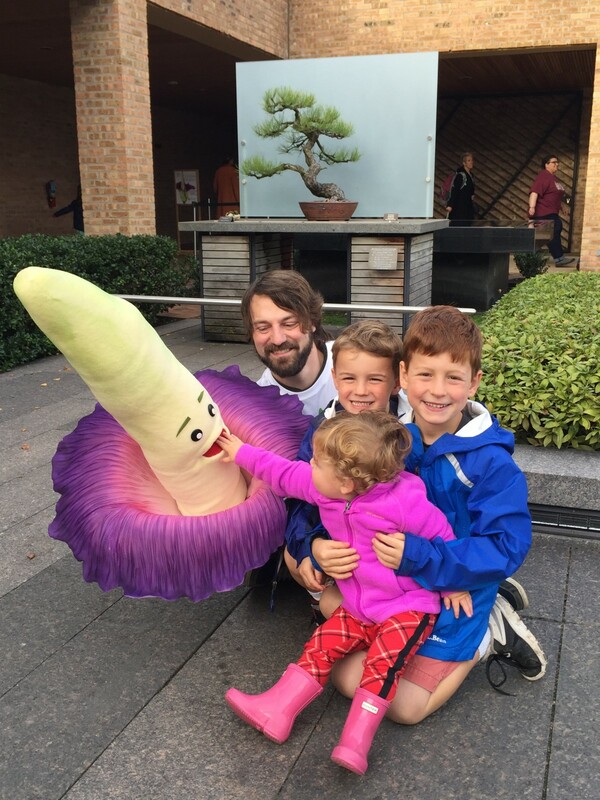 Children flocked to the puppet, thrilled to meet their first titan. Adults with big smiles took photos and selfies. Threaded Films puppets—Ross Gerbasi on the right. Thank you, Ross. It was really, really fun. This puppet is so great; surely you’llk downsize it to a Christmas ornament so we can all mark the event in our homes. Let me know when it is completed.